Leaving Michigan's Upper Peninsula I drove through Wisconsin to my brother Jerry's home in northern Illinois. I got to spend the weekend with he and his family, knocking off a couple of repairs to the Tank, and helping him resurface his driveway (mine was more a supervisory contribution). With a now conceived plan of heading back to Texas I knew my path from my brother's would be south and west so I targeted the Army Corps of Engineers' Bear Creek Recreation Area which is near the tiny Illinois town of Ursa, right on the Mississippi River. 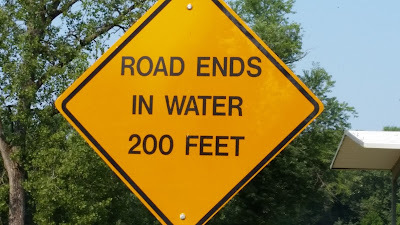 Don't use Google maps to try to get there. 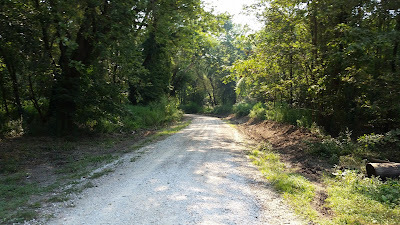 The last mile to the area was this gravel road. 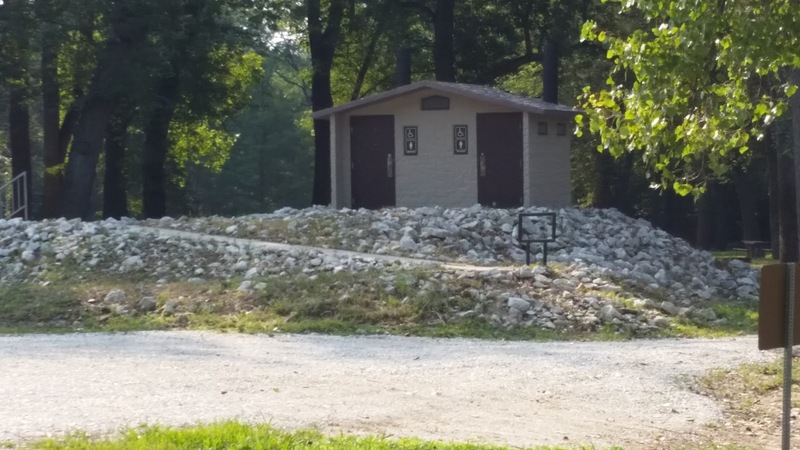 The bathrooms are built on their own gravel island. Boat ramp into "The Big Muddy". 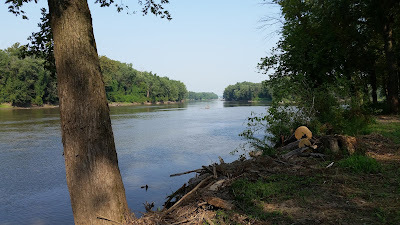 At first the width of the Mississippi along the Rec Area was a little misleading, as I've driven across it many times and it's a REALLY wide river, but not at the Rec Area. Then I looked at a zoomed in Google Maps of the Rec Area and saw the what I thought was the Missouri side of the river was actually Barns Island, a huge island that the Mississippi flows around both sides of. Barns Island on the left half of the picture. Bear Creek Recreation Area is really quiet and peaceful with an occasional train whistle far to the north you can hear sometimes at night. There was maybe two or three trucks and cars driving through it and then back out a day but really no traffic, maybe because of this sign? 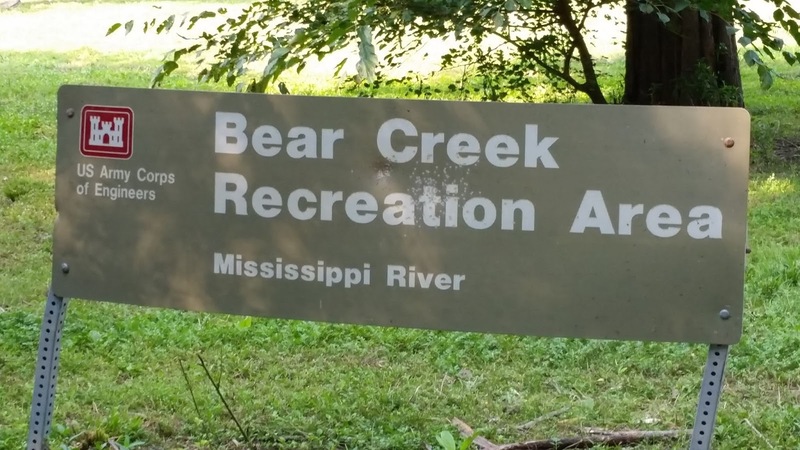 If you like a peaceful camping experience on the Mississippi River that is also free then Bear Creek Recreation Area fits your bill. 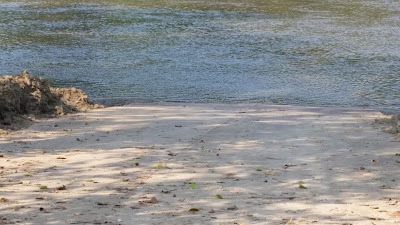 I didn't fish while there but you could see catfish (I think) jumping in the evening, but I didn't know if they were safe to eat if taken from this portion of the river so I left them alone. After weeks of packing my trash out while in Michigan's National Forests it was really convenient having covered trash cans to throw stuff away in. Just remember to bring all the fresh water you require because there is none available. Thanks! 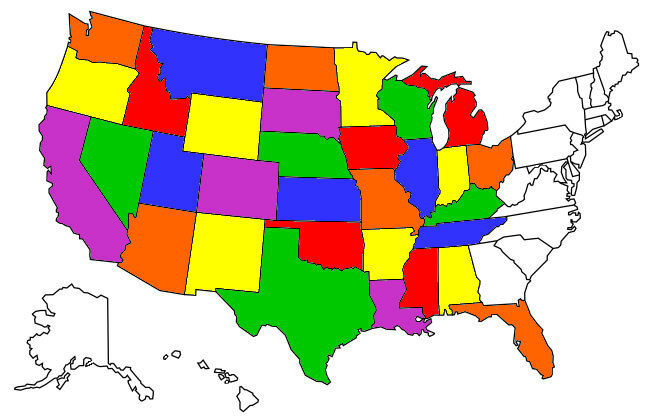 Your comment will be added after it is approved.